By day (and sometimes evening), I work for John Wiley & Sons Publishers, where I am an editor at Frommer's Travel Guides (and have been since 2000). I edit domestic and international guides in our series ranging from the Complete Guides, to the Dummies guides, Day by Day guides, and the Free & Dirt Cheap series (the first edition of Washington DC Free & Dirt Cheap guide, by Tom Price & Susan Crites Price is pictured at left). It's 320 pages of budgetary wisdom about seeing Our Nation's Capital, was published in June 2010, and retails for $16.99. Oher books I've edited have won the Lowell Thomas Award (MTV Italy), and a Grand Prize for Editorial Distinction from the NATJA (MTV Roadtrips USA). I also occasionally blog for "Behind the Guides" at Frommers.com. Cape Cod is one of my favorite places, and I have previously edited Frommer's Cape Cod, Nantucket and Martha's Vineyard. 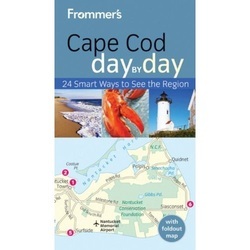 This book is by Laura M. Reckford, who lives and works year-round on the Cape, and who is also the author of the complete guide, and contributes Cape Cod chapters to Frommer's New England and the forthcoming New England Day by Day. This is my first "first edition" of a Day by Day guide (cooked from scratch, so to speak). I got to work with Laura on the format of the book, suggest specific topics, towns, and venues, and compile a photo list of suggested shots, which professional photographers captured, and then choose nearly 200 photos which grace its pages. It's 204 beautiful pages, and costs $13.99. You can pre-order it online now from your favorite bookseller, and its official pub date is April 12. 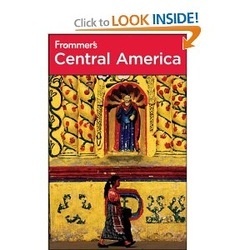 Frommer's Central America, 2nd Edition, By Eliot Greenspan, Jisel Perilla, Nicholas Gill, Charlie O'Malley. I've been posting sentences from the different chapters as my Facebook status, and people have fun guessing where I am (in the book) at the moment. It's like putting together a giant jigsaw puzzle consisting of six countries, and trying to get the most essential, specific information in there, as well as the details that give the reader the picture of each place: its people, its terrain, its cuisine, activities, language, music, art...each of the four writers takes you there and enjoys sharing the things s/he likes best. 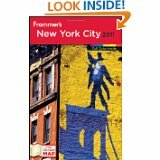 Frommer's New York City 2011. I love this book. It's a full-color guide about my favorite city in the world. The 3 writers who contribute their expertise (Brian Silverman, Kelsy Chauvin, Richard Goodman) are all longtime New Yorkers who never stop updating what's going on in the City that Never Sleeps. I've got some bylined boxes in this book: "The ABCs of TDF" as well as "Where the Editor Eats" (in both Manhattan and Queens). I'm working on the 2012 edition right now...choosing new photos, adding listings and reviews of the newest parks, restaurants, stores and hotels. It's pretty and useful. (Also available on Kindle, and also available as an iPhone app!